Homework Help for 2018/2019 will end on Wednesday, June 5th! Math Club (One-on-one Math Tutoring) For 6--12 graders. One-on-one Math Tutors are available Monday, Tuesday & Wednesday on a first come, first serve basis from 4 p.m. - 6p.m. in the Talbert Room. Registration is not required. For more information contact Melissa Ronning. 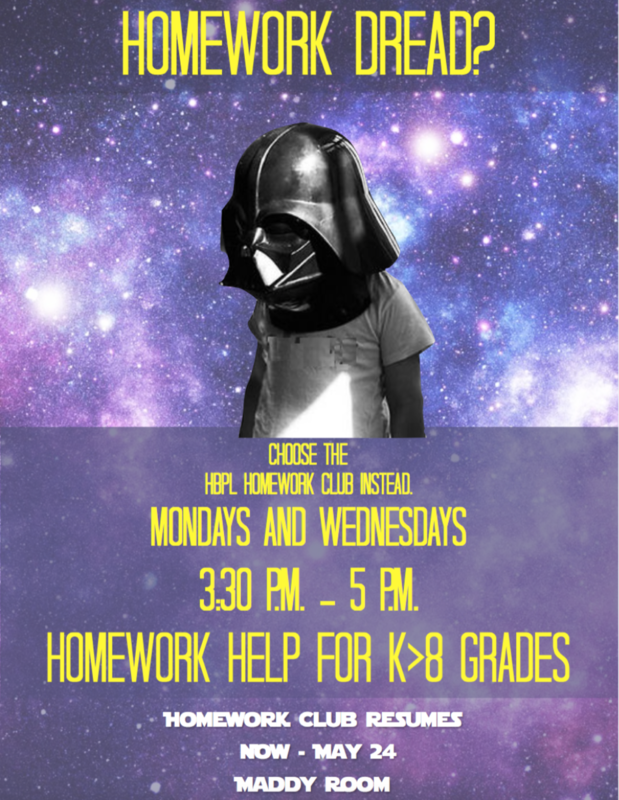 Homework Club For students grades 1-8 grades. Get homework assistance for all school subjects. Open Mondays, Tuesdays and Wednesdays between 3:30 p.m. - 5 p.m. Remember: all past and new participants must (re)-register annually for the current school year to participate. Registration forms are available during Homework Club hours. 1st-8th grade. Free homework help is available through the Homework Club on Mondays, Tuesdays and Wednesdays between 3:30 p.m. - 5:00 p.m. in the Talbert Room at Central Library. Come as needed for all school subjects. Homework Club runs from September 17, 2018- June 5, 2019. Registration is required annually. For more information, email Melissa Ronning. For 6th -12th grade. New sign up process, please read! Math tutors are available on a first come, first serve basis on Monday, Tuesdays, and Wednesday. Registration is not required. Math Club meets from 4p.m. - p.m. in the Talbert Room. For more information, contact Melissa Ronning at (714) 374-5330. Be sure to refresh this page to show any updates. To see past app listings, click on the "Website" button above. EasyBib - Create accurate, comprehensive bibliographies for reports or other cited works. FreeRice - Get smarter and do a humanitarian deed. Trivia-based game, pick your subject and test your knowledge. Reading Counts! - A Lexile-based reading program used by Dwyer Middle School. Vocabulary University - Learn English vocabulary in context (grades 2-12) with free word puzzles and activities. A free resource for parents to help their children with math (K-8). Over 150,000 interactive lessons. Searchable by grade. Dr. Math® is a virtual reference of explanations, examples, and definitions of math concepts to help people learn math together. California Fact Cards - Fact Cards are a series of research resources designed for quick reference for students in grades 4 through 8. The topics covered by Fact Cards are those California, United States, and World topics included in the social studies curriculum in California. For the past ten years, printed Fact Cards have been used extensively in California elementary and middle schools, as well as in public libraries. Colonial Craftspeople - Experience life in the 18th century at America's largest outdoor history museum. On This Day- Find out what happened on any day in history. Our Timelines - Find out how your life fits into history as we know it with this custom timeline generator. States and Capitals - Provides information about the fifty United States of America. This Day in History - Discover what happened today in history. Time Magazine for Kids - The latest news from around the world for kids in grades K-6. Includes related polls, games, and websites. Search through books, articles, dictionaries and more. Great for biographies, state reports and research projects. More than an ebook--TumbleBooks provides audio and light animation for children.